DISCOVER SOME OF OUR FAVORITE ENRICHING MOMENTS IN FRENCH POLYNESIA! Translucent lagoons surrounding islands such as Moʻorea and Tahiti offer a watery paradise as you set off straight from the ship's marina platform to kayak, windsurf or paddleboard. Snorkeling or diving brings you up close to gentle sea turtles and graceful eagle rays. Even if you've never donned scuba gear before, expert guides ensure safe passage with PADI certification before your first dive. 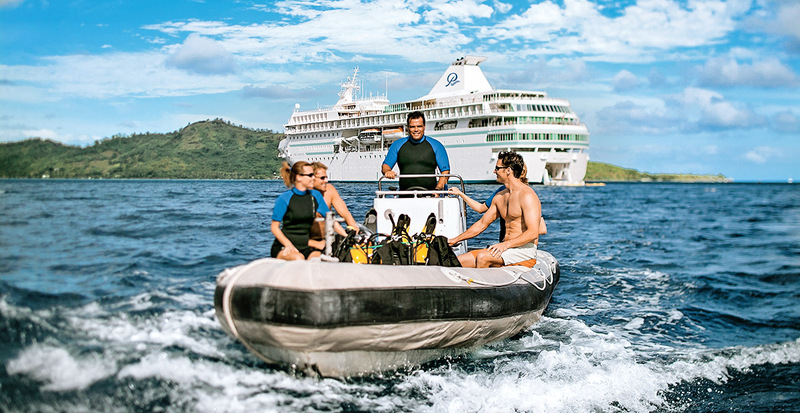 Stay a Little Longer: Let us extend your stay in Tahiti or Moʻorea before or after your cruise, enhanced by a private snorkel tour with a marine biologist. 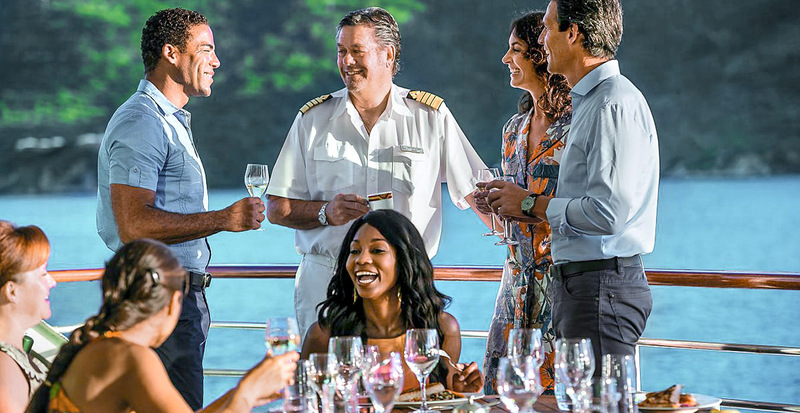 Connect with those who have deep ties to French Polynesia through onboard lectures and guided excursions. You'll step into rich history with archeologist Mark Eddowes as you hike through jungles toward Tahitian marae (temples) while learning about medicinal plants. Marine biologist Denis Schneider will change your world view as he explains the challenges facing fragile coral reefs surrounding these islands. An ever-changing cadre of guest hosts includes vintners, entertainers and scholars. Preservation through education is a hallmark of each and every voyage. A new partnership with the Wildlife Conservation Society brings leading conservation scientists, zoologists and other experts on select sailings. Younger travelers and their families can benefit from the Stewards of Nature program through engaging explorations that weave in crafts and games. Play on the Wild Side: Looking for an adventure? As your travel specialist, we'll help you plan a customized shore excursion, such as a private surf lesson in the island of Tahiti, or a hiking tour to both lush valleys and hidden waterfalls. Paul Gauguin Cruises' exclusive Tahitian troupe, Les Gauguines, enhances your cultural understanding both on board and on shore. 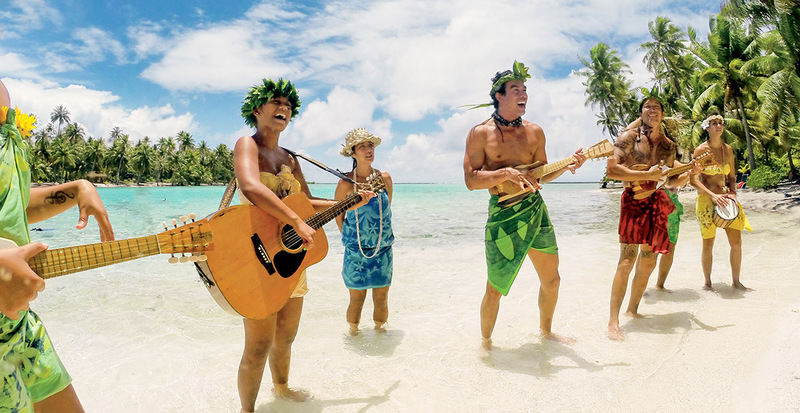 Joyful music and dance accompanies you as you sail to new shores, while a day relaxing on the private beaches of Motu Mahana may include lessons in Polynesian flower weaving and how to prepare Tahiti’s signature dish, poisson cru. Enriching encounters with Paul Gauguin Cruises permeate every aspect of your voyage, from island-inspired dining to guided excursions that reveal insight into French Polynesia’s ecosystem and cultural heritage. Watch the video below and get a glimpse of a minute in paradise with Paul Gauguin Cruises. We’ll handle every detail of your Paul Gauguin Cruises vacation, from a hotel stay in an overwater bungalow before or after your voyage, to private shore excursions during your cruise. Call us today!